Milanese ready-to-wear is a relative newcomer to the fashion world, compared to Parisian haute couture and London tailoring, but how did it achieve its status? This exhibition charts the rise and rise of Italian fashion in the post-war period, explaining how it has transformed from artisanal activity to world-renowned industry while maintaining the quality of the ‘Made in Italy’ mark. The 100 dresses, suits, separates and accessories that fill this large exhibition cover a 70-year period. The show is not designed to be encyclopaedic, but seeks to reveal the stories behind the glitz. The clothes ooze glamour, and hold their own in the presence of Elizabeth Taylor’s Bulgari emerald and diamond jewellery (lent by the show’s sponsors), but craftsmen and women get as much attention as the famous designers and their clients. Historical context for Italian fashion’s renaissance is provided from the outset through copious research into Giovanni Battista Giorgini, the former buyer who managed to get Italian designers into the American market from the early 1950s. 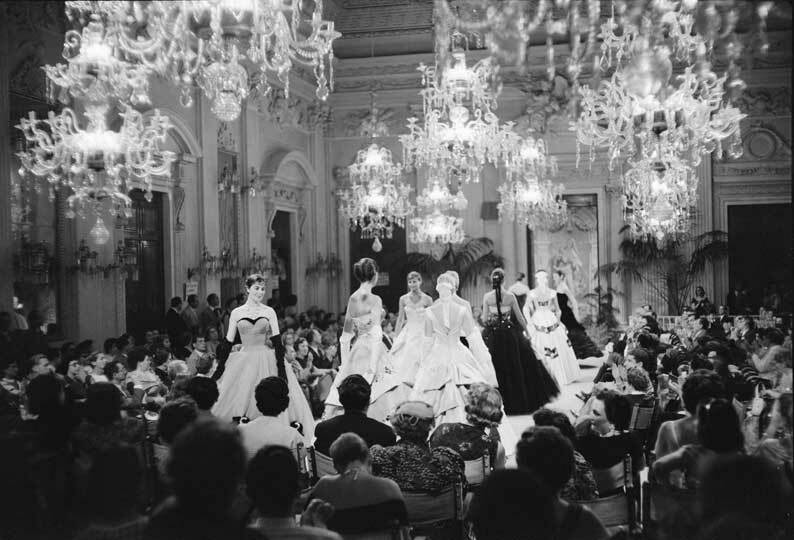 Alongside dresses from this period by designers such as Germana Manicelli and Vita Noberaska, archival materials tell the story of Giorgini’s first fashion shows, in a room styled to recreate their Florentine venue, the Sala Bianca. Some designers from this room can be traced throughout the show, for example the sculptural silhouettes of Roberto Capucci’s 1957 cocktail dress reappear later in a 1987–8 evening dress. The 1960s saw Italian fashion’s fame grow both on and off the silver screen. Italian cinema boosted menswear, which is well represented in the exhibition; the light sleek suits Marcello Mastroianni wore in La Dolce Vita caught on internationally, and director Vittorio De Sica’s 1954 wool suit by Gennaro Rubinacci, with its distinctive egg-shaped shoulder, is a fine example of Italian tailoring. In War and Peace Audrey Hepburn danced in Fernanda Gattinoni’s designs, while Ava Gardner and many others flocked to the Sorelle Fontana. Another highlight of this section is the 1971 paisley coat made for Maria Callas by Biki. The American market allowed Italian fashion to expand, contributing to the 1970s shift from haute couture to ready-to-wear, and from Florence to Milan. This period saw the dawn of the ‘stilista’, more than a designer or stylist, an all-rounder of the fashion world. 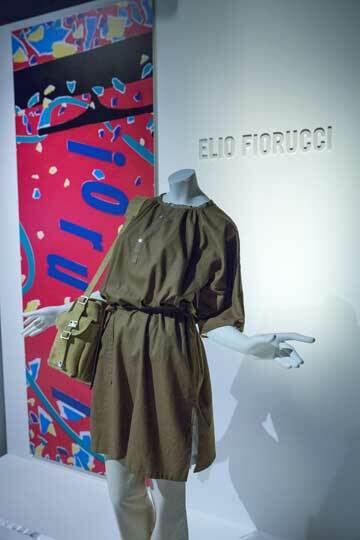 Some of these, for example Elio Fiorucci, are still household names in UK fashion, while the show shines new light on lesser-known figures such as Walter Albini. A great strength of the exhibition is the presence of material samples and original designs alongside finished pieces, which give a greater insight into the creative process. Missoni knitting patterns have coloured wool samples taped to them; a Fendi mink coat (2000/1) is seen from initial sketch through to final outfit; printed silk samples for Lancetti abound. The curator Sonnet Stanfill believes that Italian fashion’s past successes and future prosperity rely on the provenance of its high quality materials. Silk from Como, leather from Tuscany and wool from Biella are internationally recognised. The room dedicated to the 1980s ready-to-wear shows the role these played in the industrialisation of Italian fashion. 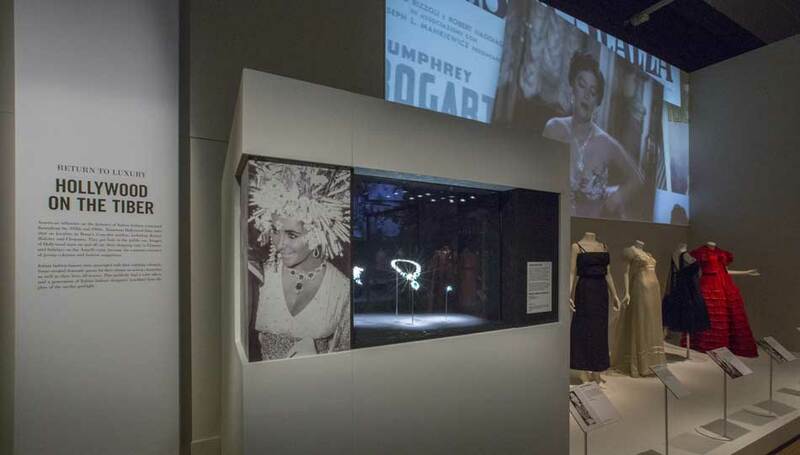 This theme can be traced throughout the exhibition: the show begins with two 1940s women’s day suits featuring the marca di garanzia, the fascist National Fashion Board’s system for encouraging the use of Italian-made materials, and the final room of contemporary couture gowns, styled like a fashion week catwalk, features a 2012 Dolce & Gabbana dress with hand-painted textiles. The exhibition finishes with a film where the great and good of contemporary Italian fashion give their opinion on the industry’s future. Fashion is clearly not immune to Italy’s youth unemployment crisis, due to the economic downturn and the tendency for older designers to stay in jobs well beyond the age of retirement. While Matteo Renzi, the Italian Prime Minister, apparently felt at home in this exhibition due to the amount of material on loan from Florence, one hopes that the focus on the Italian fashion industry may encourage some measures to support young Italian designers who could join the ranks of those exhibited here. 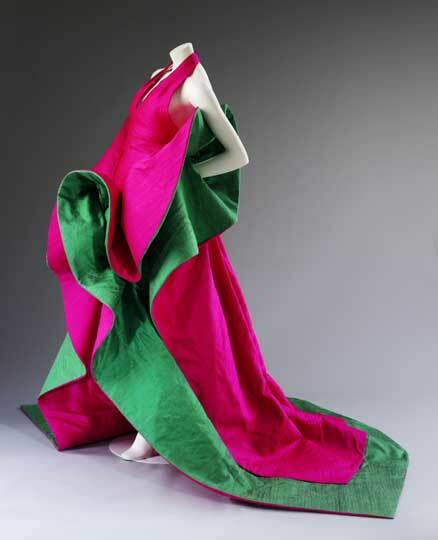 ‘The Glamour of Italian Fashion 1945–2014’ is on at the Victoria & Albert Museum until 27 July 2014. If someone claims to show Italian fashion since WWII than thay should make an effort and do something serious. Even the biggest fashionista can’t spend more than 20 minutes there, there is nothing to see! Anyway, it’s just another London tourist trap!